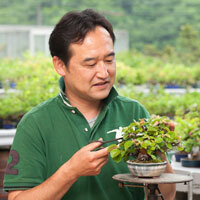 as the second-generation owner of Miura Baijuen, a leading traditional Bonsai nursery in Kansai region. At present, he actively hosts Bonsai classes not only in Japan but also in various overseas countries. He is one of the leading bonsai craftsman in Japan. He also appears regularly in Bonsai magazine "KINDAI BONAI". Executive Director of Japan shouhin bonsai association from 2015 to now. All Japan Shohin Bonsai Association (Public Corporation) certified instructor. 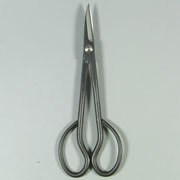 Bonsai master Mr.Hiroki Miura is using this scissors. 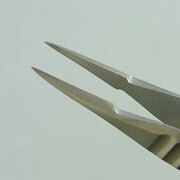 No.3A is used when we cut the branch of small bonsai and medium bonsai. 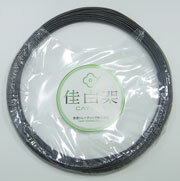 No.13A is used when we cut the branch and thicker root. No.35A is used when we cut the branch of small branch ,bud and leaves. 8) He put the tree sealer. 9) He is wiring with using Copper wire.